This pleasant little ramble is just the thing for walkers in Queensland’s hot and humid summers. 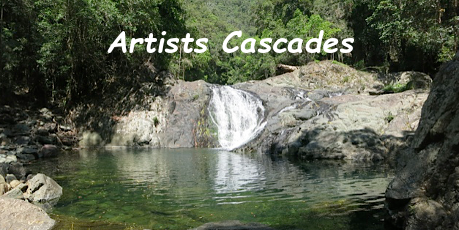 Artists Cascades are a small set of falls and cascades on Booloumba Creek in the Conondale National Park, part of the Sunshine Coast’s forested hinterland. Although you could make this a short rock hopping trip, the numerous crystal clear pools are an ever present temptation for walkers to linger as they make their way upstream. My five walking friends Alf and Samantha(leaders) and hangers-on Brian, Leanda, Joe as well as yours truly, left the Booloumba Creek Day Use Area soon after 8.30am, a bit of a late start for an overcast, humid but decidedly warmish November day. The walk is only four and a half kilometres to the cascades with an easier but slightly longer return leg on the Conondale Great Walk Track. A pretty relaxed day, all in all. 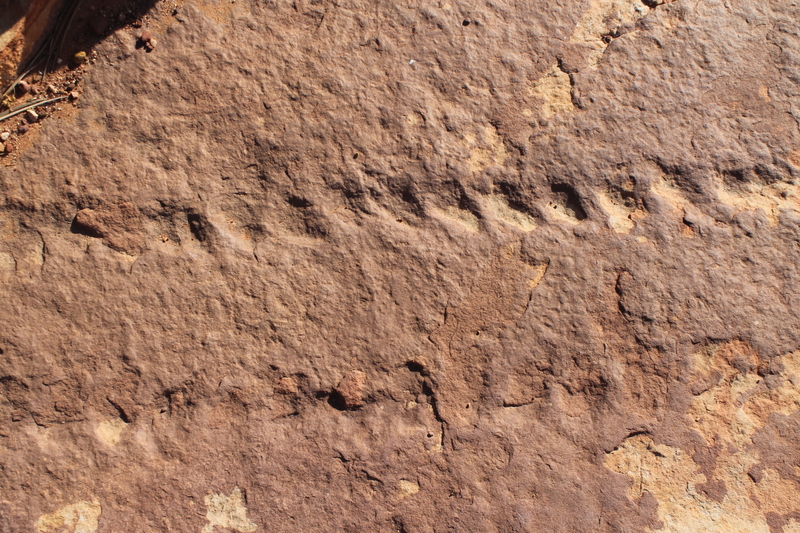 In days of yore, before the advent of formed tracks, the Booloumba Creek walk was a different proposition. 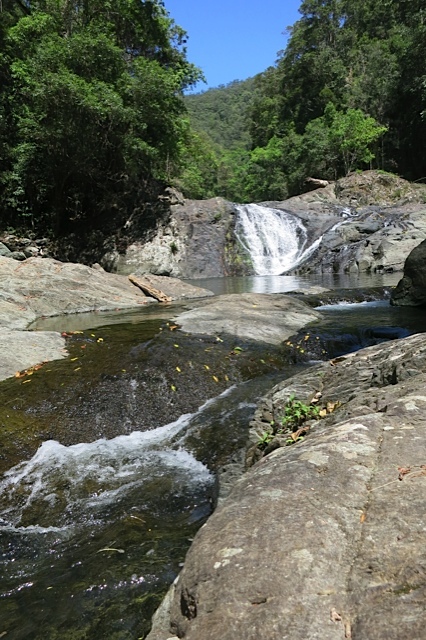 Hairy-chested bushwalkers generally entered a kilometre upstream of Artists Cascades at Booloomba Creek Falls near a feature called The Breadknife, an impressive blade-like slab of foliated phyllite, a flaky metamorphic rock. 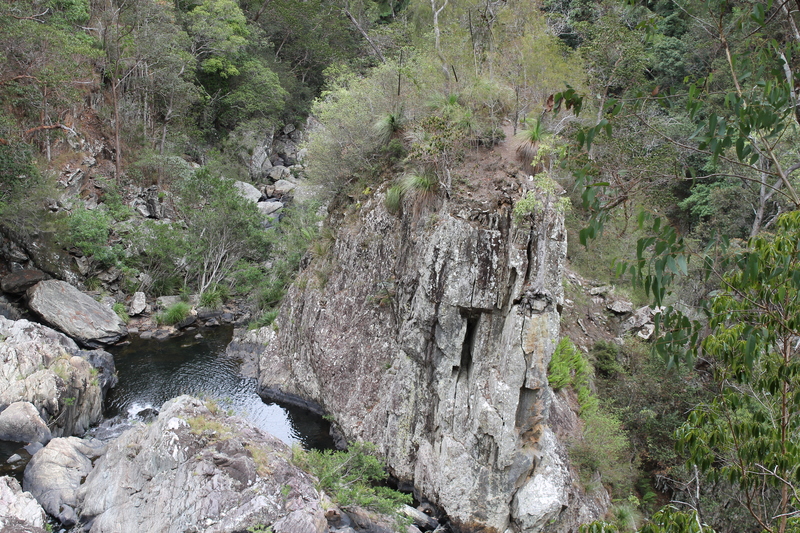 Below it, in a leap of faith, walkers would drop into Booloumba Creek for the start of the swim down through Booloumba Gorge. As my 1980’s bushwalking bible “Bushwalking in South-East Queensland” noted: “… the descent route in Booloumba Gorge… should only be tackled by competent scramblers.” Over nearly a full day walkers swam, floated and rock hopped down past Kingfisher Falls, Frog Falls, Artists Cascades to exit at the day use area, occasionally bruised and battered. Altogether a very satisfying little adventure. Our walk was a modest affair by comparison. 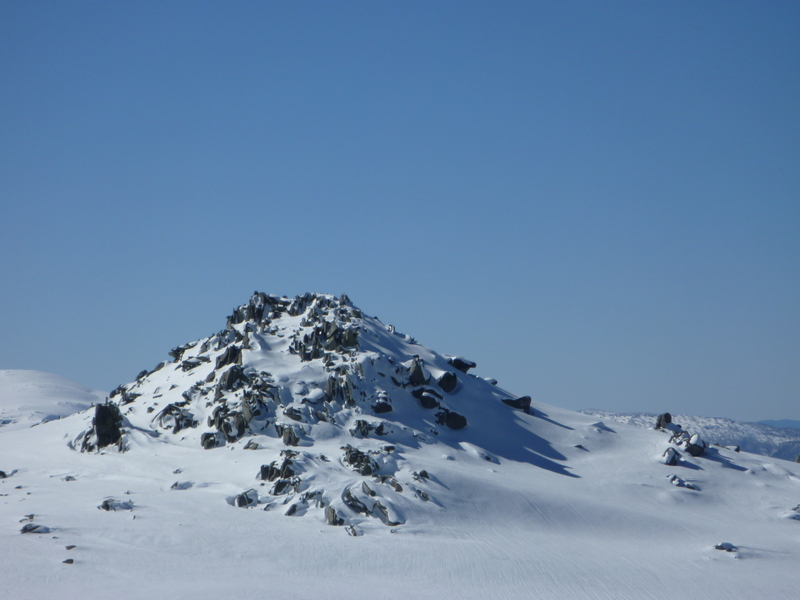 Initially, it starts as an easy amble on a flat gravelly creek bank, but as the walk closes in on Artists Cascades, the walking changes to rock hopping. 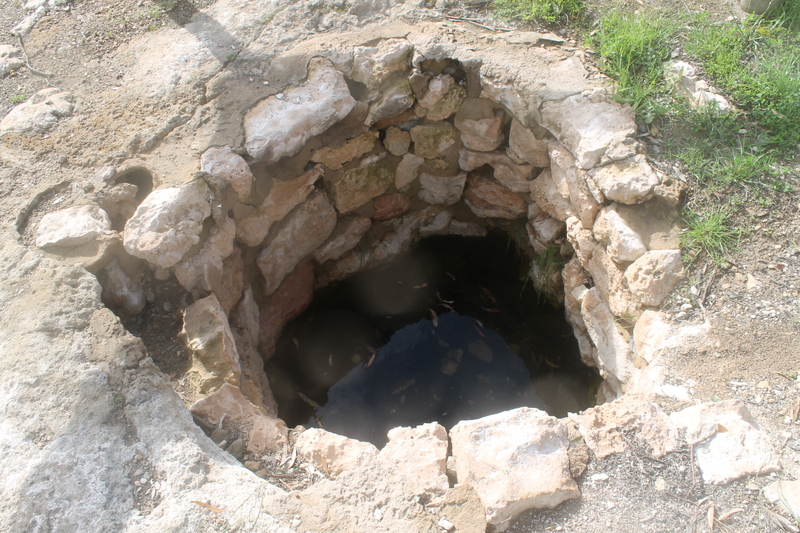 On the way up we passed a number of beautiful clear deep pools, ripe for swims and more swims. 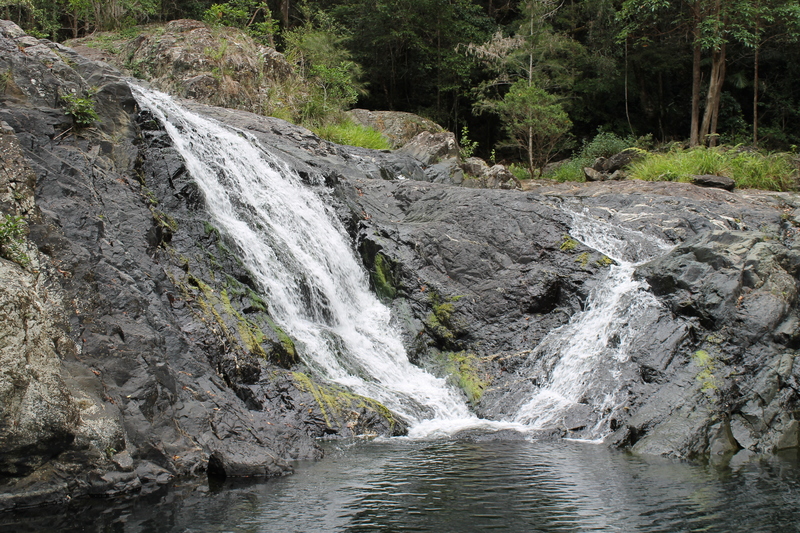 Booloumba Creek is set in sub-tropical rainforest. 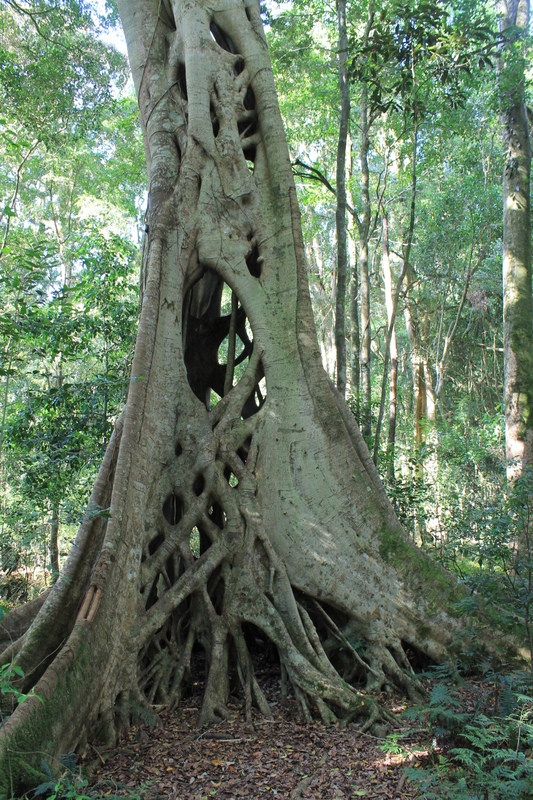 Some of the emergent species which I recognised included hoop pine Araucaria cunninghamii, piccabeen palm Archontophoenix cunninghamiana, bunya pine Araucaria bidwillii, flooded gum Eucalyptus grandis, black bean Castanospermum australe, and the strangler fig Ficus watkinsiana. 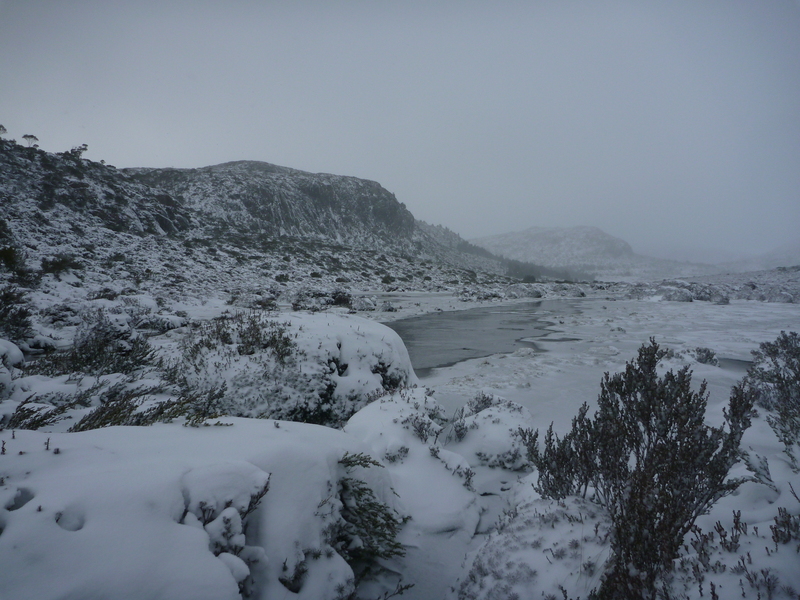 As an afficionado of the Booloumba Creek run I had come prepared, decked out in board shorts, quick dry shirt, track shoes in place of my Rossi heavy duty boots, nylon day pack with other hiking paraphernalia sequestered away in a dry bag. 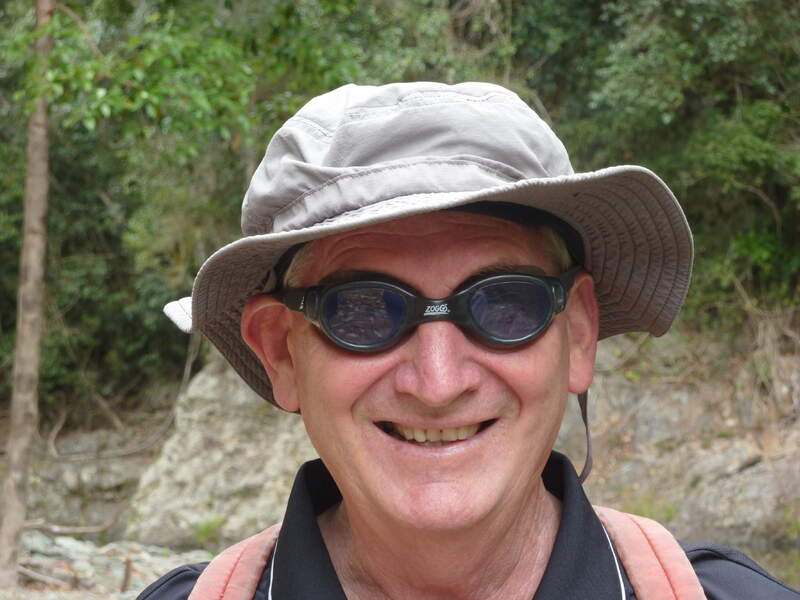 A pair of spiffy goggles found at a nearby a swimming hole enhanced my aquatic ensemble. No need to change into togs…sorry… bathers for you non-Queenslanders. Just flop or dive in. Not unexpectedly, we crossed paths with a lethargic snake, a rather large carpet python curled up and in no mood to move. As with all snakes, the golden rule applied: leave well alone, even though pythons are fairly harmless. Snakes are always a consideration in the Conondales so some of us were sporting knee length, heavy duty, canvas gaiters. Fortunately, heavy flooding over the past two summers had cleared the dense mist weed (Ageratina riparia) from the creek bed, making it much easier to hop from rock to rock and to spot the odd sunbaking reptile or three. Around lunchtime we made our way onto the rocky benches surrounding the Artists Cascades. These smallish cascades drop into a deep inviting rock pool. But we needed no invitation and were soon frolicking around in the refreshing cool, clear water. Revived, we tucked into lunch, allowing us time to start drying before squelching off on the five kilometre return leg along The Conondale Great Walk Track. 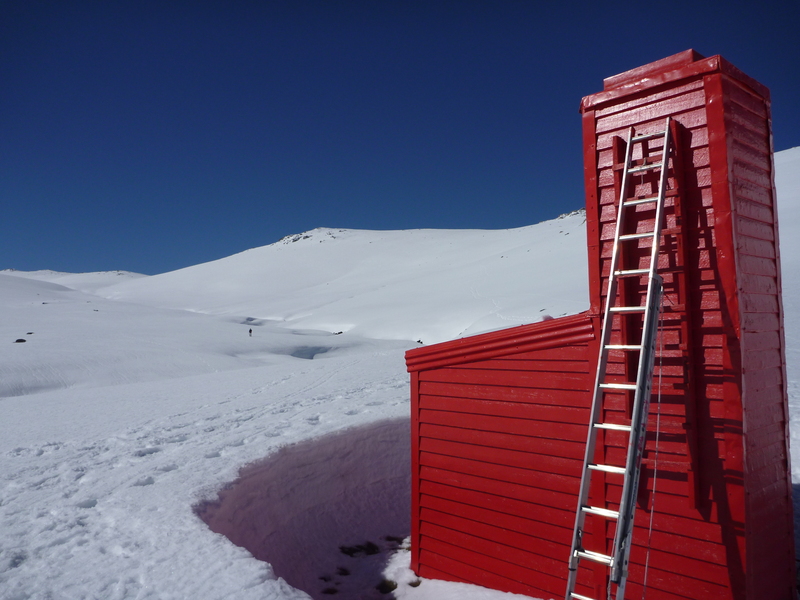 If you have time I recommend you sidetrack to the old Gold Mine site and also find the short track to the “Egg”. The track was unmarked for a long time at the request of its creator but common sense prevailed and now it is well sign-posted. The construction of The Egg morphed into a political hot potato. 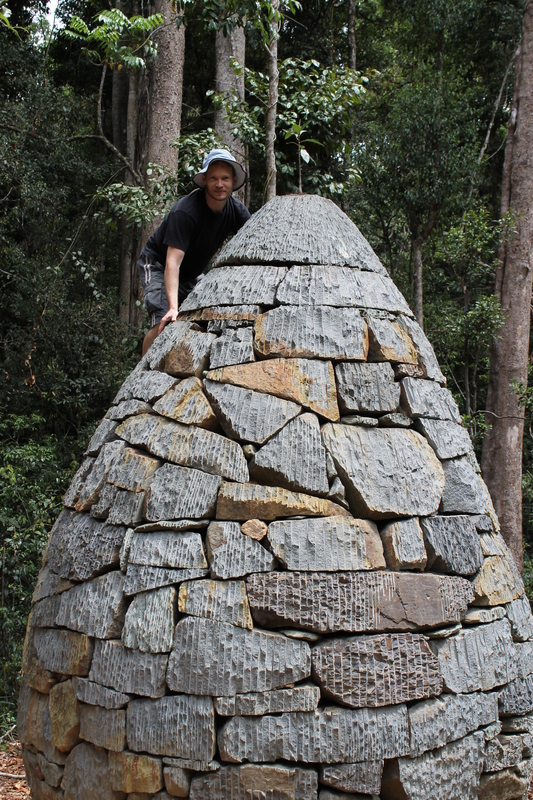 The Egg is a $700,000 wilderness sculpture commissioned by the Queensland Government in 2010, and designed and built by Scottish artist Andy Goldsworthy. But more on that contentious issue another time. 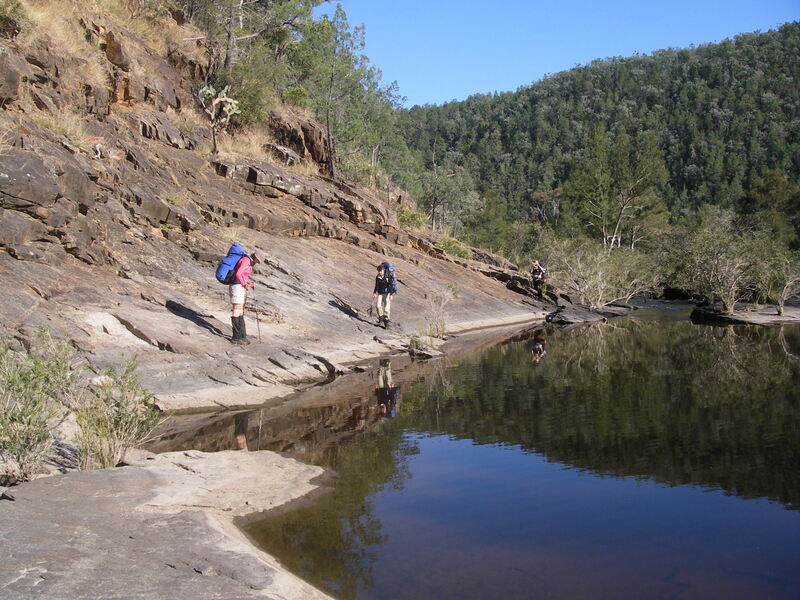 Much of the conservation battle to save this relatively pristine area of South-East Queensland from further logging and mining was undertaken by the local Conondale Range Committee for which the bushwalking and camping fraternity can be thankful. 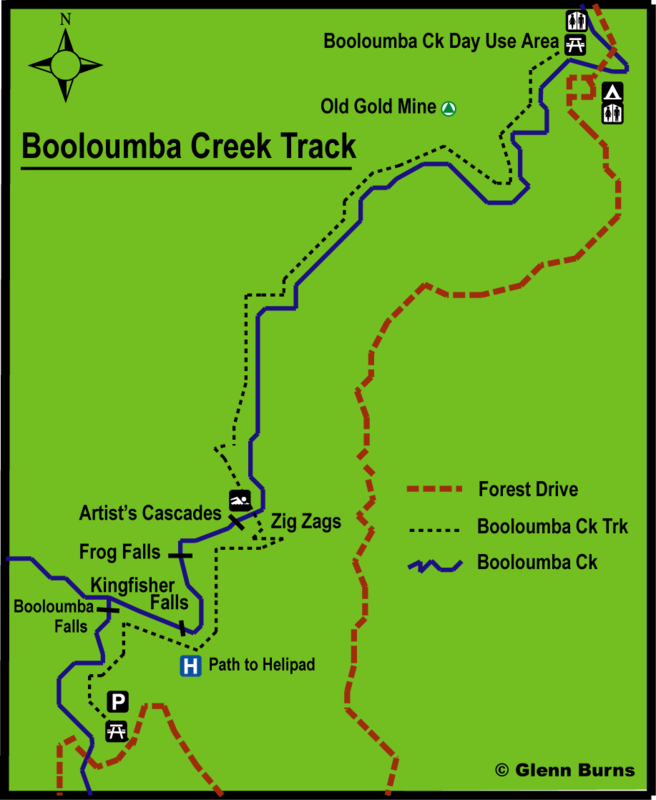 If you are wondering about the origin of the name Booloumba as I did, my friends in the Conondale Range Committee provided the following information. 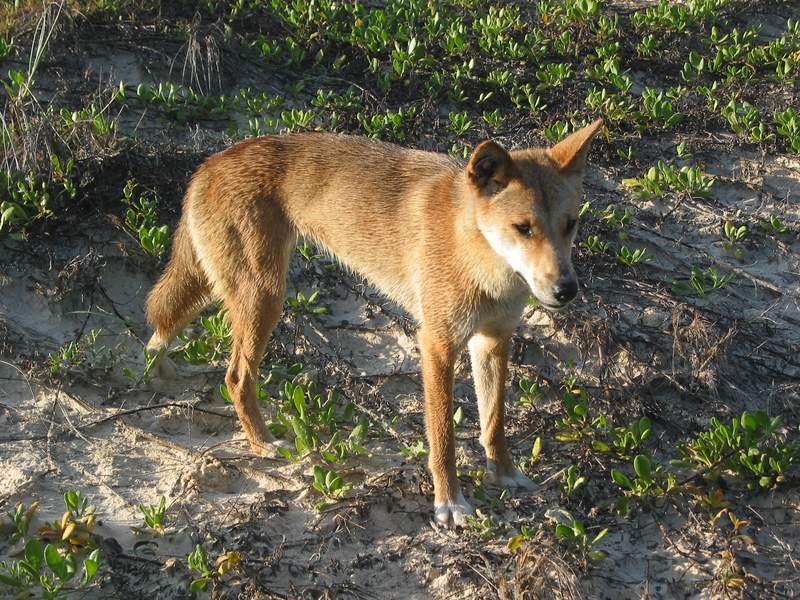 Booloumba is aboriginal, from the dialect of the Dullumbara clan who were part of the Gubi Gubi language group. It is pronounced and spelt Balumbear or Balumbir and means butterfly; sometimes extended to mean place of the white butterfly. 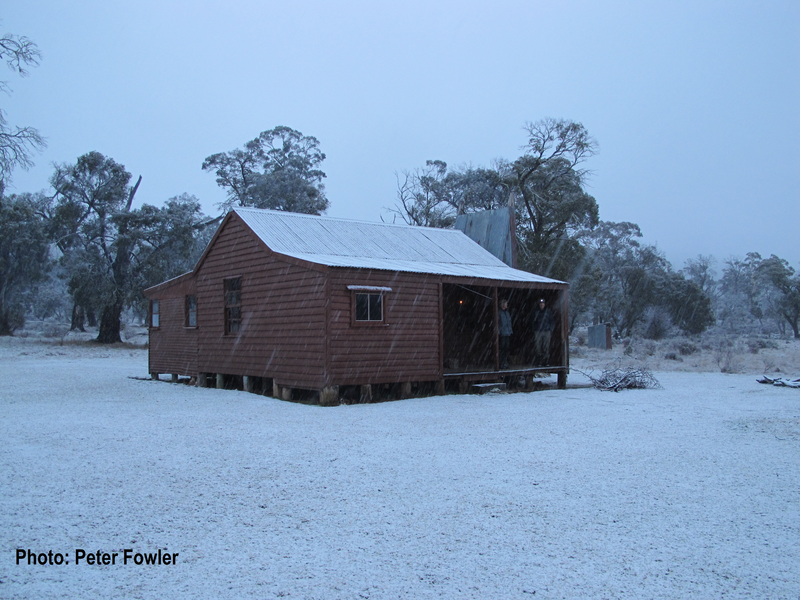 The national park name, Conondale, derives from Conondale Station, named by pastoralist D. T. MacKenzie in 1851 after Strath Conon in Scotland.